"Crota rose to petition / Father, cut the shapes into a tablet / Give me the tablet / I will bear it in battle / And tithe one side of my sword to you / Oryx cut the shapes into a tablet / But he guarded the shapes / He set the tablet in Golgoroth/ Where the new flesh grew as Eir decreed it." 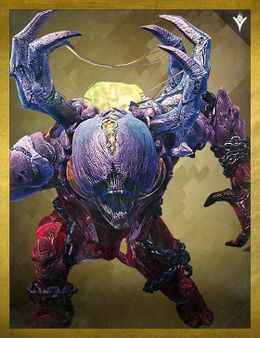 Golgoroth is a Hive Ogre that appears as the second boss in the King's Fall Raid. Previously the creation of the Worm god Xol with the purpose to devour Oryx, the Taken King and his family; the latter Took Golgoroth instead and remade it with aid from Eir into a new shape as one of the most powerful members of his court. Later when Oryx carved the Tablets of Ruin out of flesh from the fallen Akka, he sets one of them in Golgoroth as a rebuttal of Crota's demands to claim it. When Guardians first enter the room, they will need to spawn Golgoroth. To do this, one must shoot down the orb placed at the center of the room. Once Golgoroth has finished spawning, it will use its Eye Blasts to attack all Guardians in sight and suppress them. Waves of Thralls, Acolytes and Adepts will spawn at the left and right sides of the room; kill these to begin the next phase. Once all adds are dead, one Guardian will have to gain Golgoroth's attention as the five others shoot down one of six orbs. To get "Golgoroth's Gaze", the tasked Guardian will shoot the giant yellow sack on Golgoroth's back. The Guardian who shot this will now have to shoot the "Ogre's Venom" orbs fired by Golgoroth (three to four depending on difficulty). Whomever gets hit by one of these orbs is poisoned. As this is happening the five others will enter the pool under the orb they destroyed and start shooting the blue spot on Golgoroth's opened chest. At any time a Guardian can hop out, destroy another orb, and take Golgoroth's gaze. This may be repeated as many times as wanted, up to six times per wave. After the message "Failed to capture Golgoroth's gaze" appears another wave of adds will spawn. Once at ~25% of his health, Taken will spawn instead of Hive. Once six deaths have occurred, the Tablet of Ruin will be completed and all Guardians will be Drained of Light by the Soulsiphon Plinth and then killed. In Hard Mode, jumping in a Pool of Reclaimed Light becomes a much more dangerous prospect, as one Guardian at random will be inflicted with a debuff called "Unstable Light", where the Guardian detonates, dealing massive damage to others nearby. This allows Golgoroth to cause a team wipe early on in the encounter and also forces Guardians to jump out of the pool sooner than usual. For Challenge Mode, each member of the fireteam must hold Golgoroth's gaze in each damage phase. Golgoroth's name may be inspired by the Erd Gorgoroth Mountain chain in the north of Beleriand, named such by the Sindar of Doriath after the spider-creature Ungoliant made it her temporary home, and wove webs which sucked away all light and poisoned the land, much like Golgorth's Ogre's Venom ability. Both of which could have come from the Biblical location Golgotha (Hebrew). Gol-Goroth is also the name of a Cthulhu Mythos deity, described in one form as a colossal black toad with an impossibly malevolent gaze.